ANU Scientists are a step closer to using Australia’s iconic gum trees to develop low-carbon renewable jet and missile fuel. 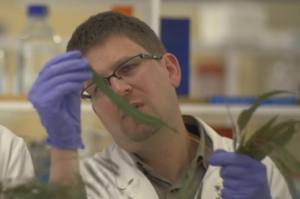 Dr Carsten Kulheim, a lead researcher in an international study published in Trends in Biotechnology, said renewable fuels that could power commercial aeroplanes were limited and expensive but a solution could be growing all around us. “If we could plant 20 million hectares of eucalyptus species worldwide, which is currently the same amount that is planted for pulp and paper, we would be able to produce enough jet fuel for five per cent of the aviation industry,” Carsten said. “The aviation sector globally produces about two per cent of all human-caused carbon dioxide emissions. “Eucalyptus-based fuel would initially be more expensive than fossil fuels to make on a mass scale, but would produce significantly less net carbon emissions. “Powering a modern jet aircraft with anything other than fossil fuels was difficult, due to the high energy required. “Renewable ethanol and biodiesel might be okay for the family SUV, but they just don’t have a high enough energy density to be used in the aviation industry. Co-researcher David Kainer said jet fuel derived from eucalyptus oils would be close to carbon neutral. “It has minimal ecological impact,” he said.